Have you experienced RF noise coming “out of the blue” and effectively shutting down your VHF communications? My first experience with RFI was shortly after getting my first iPhone. While driving, my favorite D-Star repeater range was suddenly reduced dramatically. Since D-Star is digital, I could not hear a RFI noise. The radio seemed deaf, but was actually drowning in the frequency specific noise-floor. Other frequencies were not predictably affected. I could sometimes see the S-meter bounce around. But not always. My routine was to get in the car and use the opportunity to charge my iPhone. One day i happened to disconnect the iPhone from the charger while looking at the radio. The S-meter what at zero. No noise? I unplugged the non-Apple, but name brand, plug in charger and all noise was gone. Could a famous battery name brand 12vdc to USB really almost shut down VHF communications? The answer is YES! The cheap voltage converters are cheap because filtering is sub-standard. 12Vdc LTE Router with ethernet ports for onboard intranet – no problem. 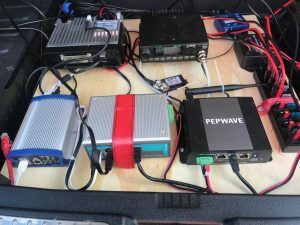 12Vdc WX3in1 TNC for APRS and I-Gate – no problem. 5Vdc SharkRF OpenSpot for DMR Mobile HotSpot – Unit is OK. Power Supply??? 12Vdc to 5Vdc USB type converter. Suspect to become noise. Chinese hardwired unit – appears quiet? Changing antennas – appears to have no effect – still quiet. Remounting all remote radios from “laying around” to a plywood plate and adding a computer network switch. No big deal, right? Running short on ethernet ports (do not like WiFi when possible to use wire). Added a MOXA EDS-305 industrial multi voltage router to survive the fluctuating dirty voltage in a car. – NOISE when cables are plugged in., however, not when not transferring data.